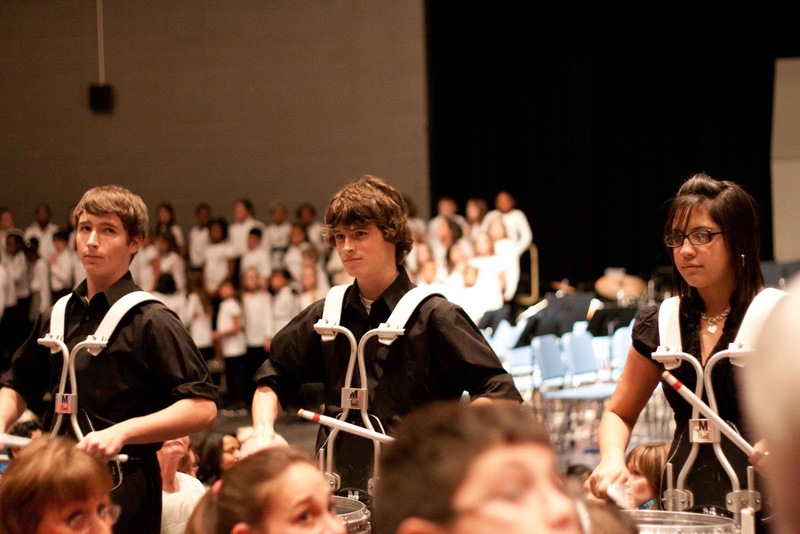 The 2nd Annual Governor Thomas Johnson Feeder Pattern Concert was held last night. 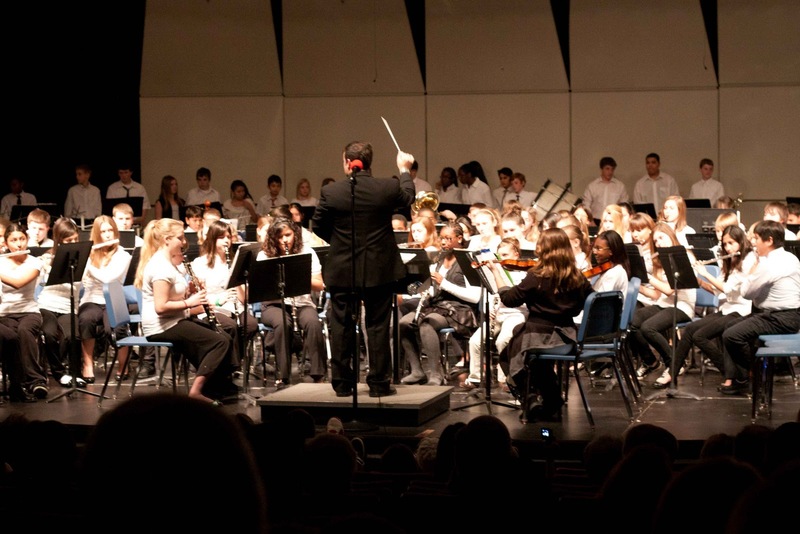 This concert is a showcase event of the band, orchestra and choral programs from all the elementary and middle schools that feed into Thomas Johnson High. The purpose of the event is to highlight the musical talent that overflows in our schools, to promote music and arts education and to generate parental and community support for that education. Over 500 music students from five elementary schools, two middle schools and one high school performed. There were stirring choral performances from the both combined elementary and combined middle school choruses. 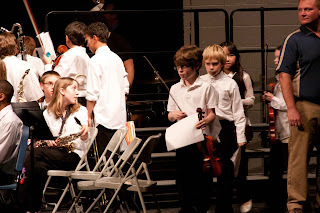 The combined elementary band played a rousing rendition of "Louie Louie". As the stage was changed from elementary students to the middle schoolers, the TJ drum line performed in the theatre aisles, receiving a rock star-like response. 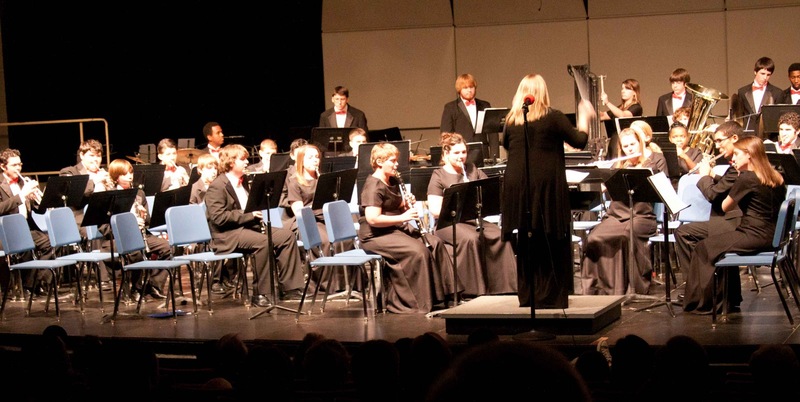 ...and high school band and orchestra played beautiful and challenging selections. Even the TJ colorguard was there, in the aisles, spinning their flags and rifles and getting huge applause from the crowd. And if all this wasn't enough, the high school chorus gave us a taste of hometown "Glee" with Journey's "Don't Stop Believin'". All of these groups performed individually with stage changes in between. The organization of these stage changes was seamless. The kids moved on and off stage quickly and orderly. Everyone seemed to know exactly where they needed to be at all times. I must point out that these kids only had ONE rehearsal to prepare for this night. Of course, each individual school group rehearsed at their own schools for much of the fall semester preparing for their own school concert. But there was only one rehearsal with all 500+ students to organize the logisitics of this performance. 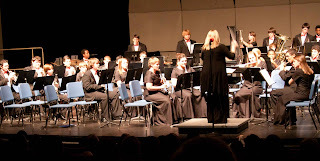 I am amazed by the organization and commitment of all the choral and band directors involved and specifically the lead organizer, Christy Caulfield. Ms. Caulfield is the TJ High band director and apparently the brains behind this large event. She does a fantastic job with help from lots of supportive teachers, administrators and parents. And of course, highly talented music students. The evening's finale was the most impressive part of all. All 500+ students were on stage performing together. The band played while the chorus sang "America the Beautiful". The musical bridge was overlayed with a rhythmic recitation of the "Pledge of Allegiance" by all the students. I did hear several audience members joining in to sing and pledge. An unspoken purpose of the evening was to make all hearts in the audience swell and burst. I think all of the evening's purposes were reached. Who can keep their emotions in check to sound of 500+ children's voices singing the praises of our great country? Please click on the above picture to get a better view. It is an amazing sight. That IS amazing! I was so glad when YS said he wanted to be in the band! (Once a band geek, always a band geek!) That's a great idea to have something going on while there's a "set change". I may have to suggest that to our director. Even if it's the guard performing to a recording. Looks like it was an amazing organizational feat! I always feel teary eyed when I hear America the Beautiful...and I agree...Music is a beautiful thing! I can only imagine what an incredible evening that must have been. Thanks for sharing the great photos.